Wondering what the best fishing knots for braided line are? The same old knots that you use with mono won't necessarily work with braid. 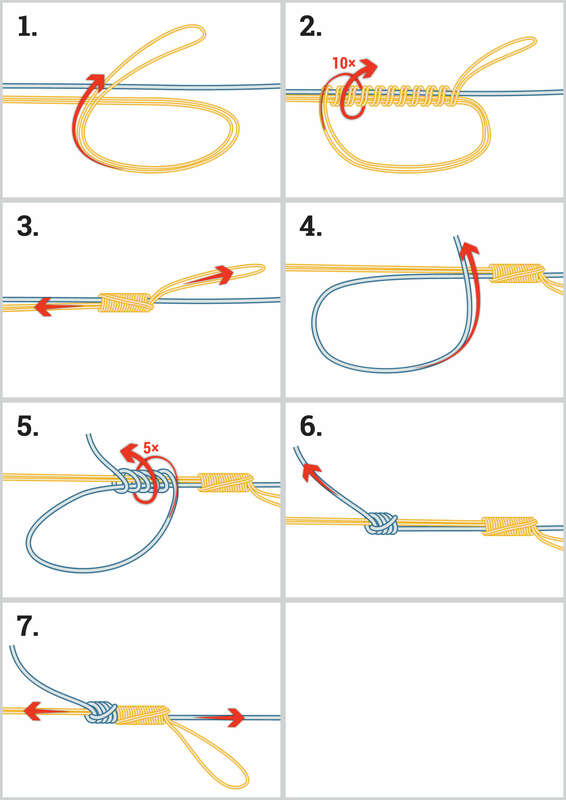 I'll cover what knots to use with braided fishing line when connecting straight to a hook. 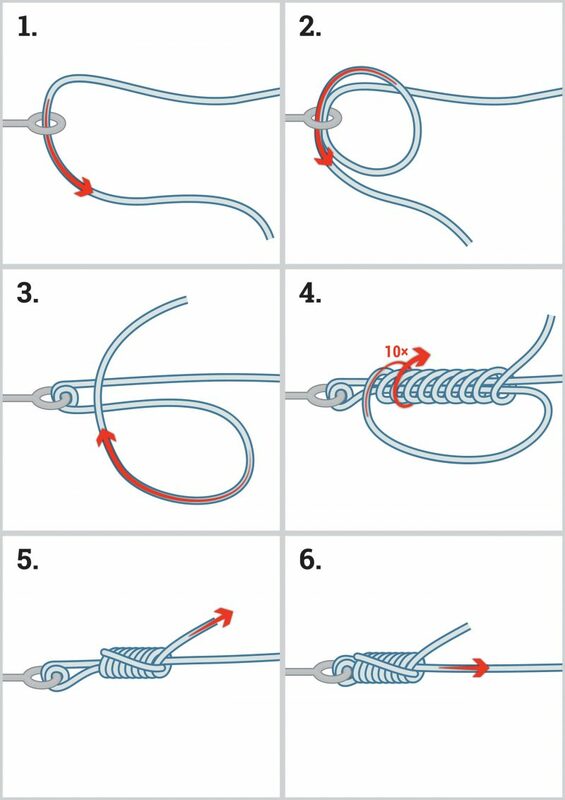 We'll also cover what knot to use when connecting to a mono or flouro leader. Combine these knots with the right braided line, and you'll reduce the chances of getting broken off. The uniknot has been around for ages. It's a great knot that holds near 100% knot strength for mono. Unfortunately braided line is slippery. This can cause the uniknot to slip and come undone when used with braid. The good news is that with a couple of small changes, you can make it a great fishing knot for braided line. All you need to do is go through the hook eye twice and then instead of the normal 5 wraps use 10 or more. Make sure you pull enough line to get 10 wraps. When you connect your braided mainline to a swivel and then to a leader, you could have some problems. If you cast the lure out and the swivel passes through the guides, it could damage them. One way to remedy this is to make sure your leader is short enough that you never have to cast it through the rod guides. Another potential problem is that now you have to tie 2 knots. One on each end of the swivel. This can take up valuable extra time. I used to think that tying braid directly to a leader was difficult. But with the knot shown below, I now think that this is a much better option than a swivel. There are exceptions to this of course. If I'm using a lure that twists the line. In that case, using a swivel is the right call. Or I may be using a multi lure system with separate lines of other lures or sinkers. Above I explained that I try avoid swivels because they can damage rod guides. One option is to use a very short leader so you don't have to pull the swivel through the rod guides. But using a very short leader is also a potential problem. Braided line is much more visible than mono or flouro. This can cause fish to become spooked by the presence of the line. Without a swivel, I can use a much longer leader. This will ensure that cautious fish won't be bothered by the braided line. Also, a line to line knot won't damage the rod guides. Yes, if your line to line knot is very bulky, it could cause extra friction. But the trade off should be worth it. Some flouro leaders completely disappear even in clear water. This could help you catch a fish that would otherwise, not be willing to bite. Choosing between a mono or flouro leader, depends on the application. For example, if you're using a lure or bait that sinks, flouro is the right choice as it will sink too. But if you're using a topwater lure, you'll want to use a mono leader. Mono has a lower density than flouro. This means that it floats much more easily. I've read many times that braided line has better abrasion resistance than mono. Unfortunately, I have found the opposite to be true. After fishing over coral reefs for many years, it's clear that braid is nowhere near as abrasion resistant as mono or flouro. So, if you're going to be fishing near rocks, coral or anything abrasive, you'll want to make sure that you're using a shock leader that's long enough to prevent the braid from getting shredded. This is where being able to tie a braid to leader knot will come in handy. You may be familiar with the double uniknot that's used for connecting two lines together. Unfortunately, the slippery nature of braided line can compromise this knot. Knot slippage is one of the biggest problems with fishing knots for braided line. A great solution to this problem is the double double uniknot. To tie the double double all you need to do is double up the braided line. Then, you just tie a double uniknot as you normally would. There may be other knots out there that are touted as having a better line strength. But there is a beauty in the simplicity of learning one knot type that is multi purpose. After you memorize the uniknot and it's variants, you should be ready for just about any fishing situation. Cutting braided line can sometimes be challenging. The slippery nature of braid and it's low memory can cause it to bend and not cut cleanly. Worse, you could end up with several partial cuts and have a frayed mess. To avoid this, you need a cutting instrument that can apply the friction that braid lacks. Using scissors coated with a rough texture will usually do the trick. Another option is to use scissors with very small serrations in the blades. Some anglers insists that extra sharp blades are the key. This helps, but getting the right amount of friction in the cut seems to be the key.